The 25th-ranked Hofstra Pride Wrestling team returns to action this Saturday, Jan. 15 when they travel to George Mason University in Fairfax, Virginia for four matches at the CAA Duals. The Pride will face defending CAA champion Binghamton, Boston University, Old Dominion and George Mason. Hofstra is coming off a thrilling, 19-17 come-from-behind victory over North Carolina at the David S. Mack Sports Complex last Saturday. Sophomore Steve Bonanno, with a major decision at 125, and senior Lou Ruggirello, with his seventh pin of the year at 133, brought the Pride back into the match, and sophomore newcomer Matt Spataro posted a 2-0 victory at 149 to give Hofstra the win. The win over UNC was even more impressive when you consider that the Pride wrestled without three starters as senior Ryan Patrovich, at 174, and sophomore Justin Accordino, at 149, sat out with knee injuries and junior Vince Varela was out with the flu at 141. That caused a reshuffling of the line-up with red-shirt freshman Zach Clemente and junior P.J. Gillespie bumping up a weight class to 165 and 174, respectively, and two newcomers, junior Mike Doria and Spataro, filling in at 141 and 149, respectively. While Varela will return this week, Patrovich is a week or two away from returning and Accordino’s timetable is unknown. But with the start of the conference season Saturday, Gillespie will return to 165 and Spataro will continue to fill in at 149. Hofstra, which is 68-4-1 in its last 73 conference dual matches, has been challenged by injuries and conference opponents the past two seasons. 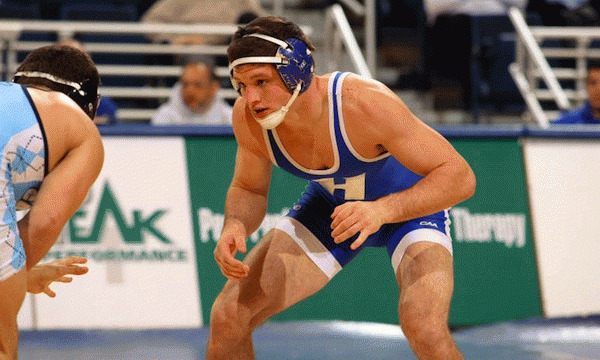 Hofstra has a solid history at the CAA Duals in their previous seven appearances. Hofstra is 28-2 in CAA Duals match-ups, including 5-0 marks in 2006, 2007 and 2008.